Your Local Search Rankings are Great, So Where are the New Patients? Your Local Search Rankings are Great, So Why Are You Failing to Attract New Patients? Developing a successful SEO strategy can help your dental practice win the coveted top position in Google’s local search results. From this lofty position, the number of new patients you receive should easily increase as you continue to rank at or near the top for all relevant keywords related to your practice. However, what happens when patients continue to find your practice online but keep getting lost on the way to scheduling an appointment? How can you rank highly in local search results but still not convert those new patient leads into appointments? This can be one of the most frustrating situations any small business can experience when trying to solve the mystery of digital marketing. But before you start wondering what’s wrong with your target audience – in this case, potential new patients – take a moment to consider the problem may actually be with you. Or, more specifically, your marketing message. While your initial SEO strategy was successful enough to get interested patients to click on a link to your website, clearly something is missing if visitors start clicking away from your site before you can deliver your carefully crafted marketing message. Leading potential new patients to your website is only the first step in executing a successful local search marketing strategy. There are a number of other important steps you need to consider when developing your digital marketing strategy to increase the number of new patients you attract. If you’re increasing website traffic but failing to engage, nurture, and ultimately convert visitors into new patients, you’re doing all of the work but with no reward. Attracting a new patient requires the right mix of message, timing, and interest – all colliding perfectly. There are four foundational pillars on which patient acquisition and retention are built: attraction, conversion, follow-up, and tracking. Strengthening these basic principles are what you need to focus on once a potential new patient reaches your website. Very few people are prepared to immediately make a buying decision when presented with their first few options, including when it comes to selecting a dentist. Once a potential new patient discovers your website, they need to get to know you, like you, and then begin to trust you enough to place their dental care needs in your hands. This is where a well-designed website can thrive when it comes to new patient acquisition. By using the design and content of a website to propel your narrative, you can successful engage with prospective new patients until they feel comfortable enough to call or click to schedule an appointment. Small dental practices or businesses don’t survive by placing their needs ahead of those of the customer. While most every business owner can agree with this principle, dental practices violate this rule frequently when designing their websites. As a local marketing agency that specializes in designing dental practice websites, it’s not uncommon for our team at Local Fresh to see our client’s old websites place way too much focus on the dentist rather than the patient. By wasting valuable space on their website talking about their experience, education background, or commitment to the community, it’s easy for a dentist to devote too little space to addressing the dental concerns of potential new patients. The end result is a website that is far more cluttered and unfocused on what’s really important – caring for the oral health needs of its patients – than what’s required to attract new patients. The entire focus and structure of your website should be on the patient experience. What ranks as most important to the needs of your patients? What are potential new patients looking for? Try to make the dental solution the focal point of your content, and only mention yourself in relation to your unique selling proposition – what you can offer that no other practice can. While the practice of dentistry is complicated, the needs and wants of prospective patients are not. They want to look and feel their best, while knowing their oral health is in the best hands possible. Every page on your website needs to focus on these priorities in order to move the relationship forward from prospect to patient. Otherwise, no matter where you rank in local search results, you’ll never attract the number of new patients your practice needs to grow. Marketing for dental practices was once a simple process. 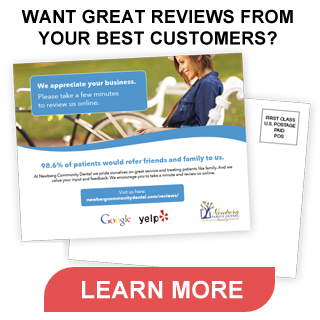 Buy a few Yellow Pages ads, send out some marketing fliers, and then wait for the new patients to start calling. Unfortunately, what worked 20 years ago won’t produce any results today. Patients today have more options than ever, and can easily find a “dentist near me” with a few keystrokes. The average user visits more than 10 online sources before deciding on a place to spend their money, according to Google. You simply cannot allow your marketing message to get lost on your website if you hope to capture the attention of new patients. You need to keep your message focused by developing an elite user experience for every visitor, regardless of whether they’re ready to make a purchase decision. Walking this line can seem tricky to many practice owners and is where Local Fresh can help. Your website needs to appeal to patients that are both ready to schedule an appointment and to those simply looking to collection more information. You need to present your message in a way that will leave the door open to each prospect while still maintaining a concise narrative that lets the patient know you both understand their concerns and can provide the high-quality care they deserve. Walking this tightrope requires having a well-designed website. Populate each page of your site with content that keeps the focus on calls-to-action and patient solutions. A basic call-to-action includes your online contact form and phone number. You also need alternative ways to engage with prospective patients even if they are not ready yet to schedule an appointment. This can include opt-in features on the site that allow visitors to exchange their contact information for something of value, such as a special offer, blog post, or discount. Use the contact information you collect to keep in contact with those prospective patients. By consistently engaging the visitors to your website, you’ll begin to convert more prospects into patients. While this is often a delicate balance that requires more than a little precision to pull off, Local Fresh is here to provide the assistance your dental practice needs to thrive. Click here to find out what Local Fresh can do for you.